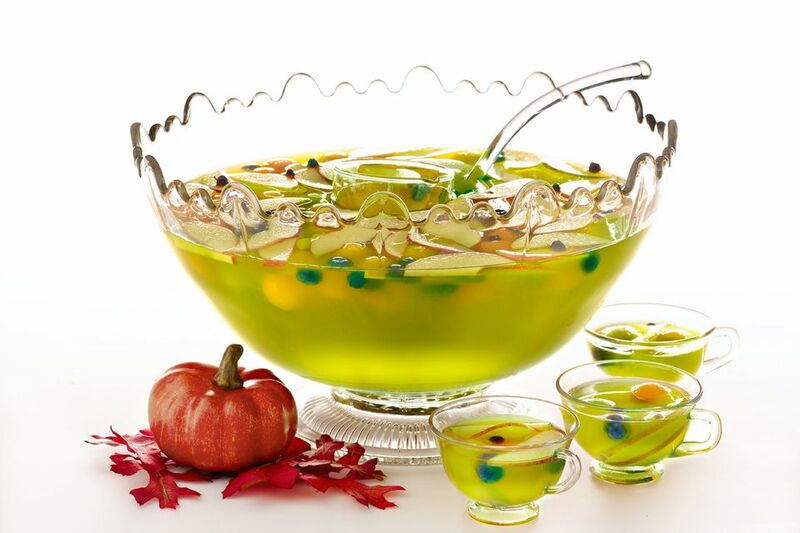 With its glowing emerald hue, this party punch is great for a Halloween celebration, but also works for any party where you want to spoil guests with a spectacular—or spooktacular—green drink. The great thing about this recipe is that you can adapt it to fit any size of party by doing some simple math and following the theory of "measuring parts." It was created by mixologist Victoria D'Amato-Moran and has a wonderful fruity flavor that will appeal to many tastes. Pour the Midori, rums, juices, and simple syrup into a punch bowl and mix well. Top with the apple slices, blueberries, and melon balls. To chill this punch you can add an ice ring or block to the bowl, place the punch bowl in an ice bath on the serving table, or supply an ice bucket from which guests can pull as many cubes as they like while filling their glass. For an individual cocktail: shake and strain into an old-fashioned glass.